With five men dead, twelve injured, and neighborhoods cut off from gas and electricity, the collapse of the Division Street bridge in 1915 remains one of Spokane's worst disasters. In the wake of the tragedy, city planners began to place bridge safety at a higher priority. It was a typical winter morning on December 18, 1915, as two streetcars began to cross the Spokane river via the Division Street bridge. When the cars met on the middle of the bridge, steel girders ripped from the bank. One streetcar hung up on the tangle of twisted metal beams, but the other plunged all the way into the icy Spokane River below. Sparking wires and twisted beams made rescue difficult, and five people drowned. Seventeen passengers scrambled and escaped the wreckage. 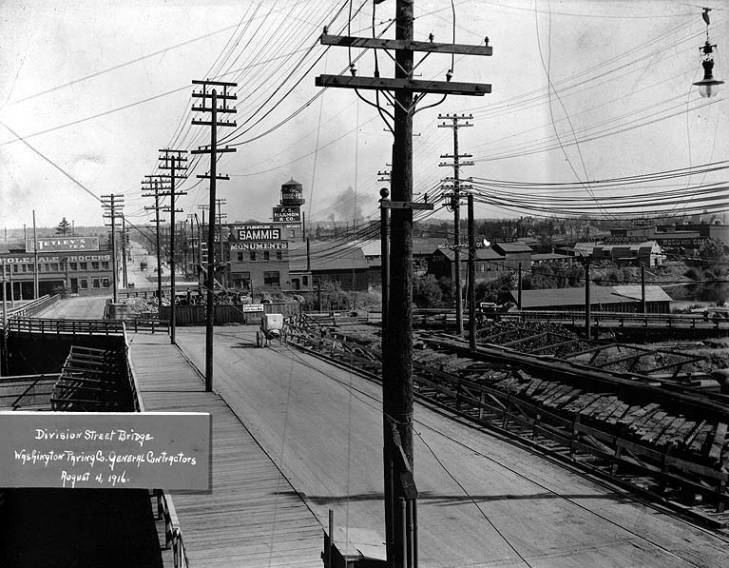 By 1917, just two years after the collapse, construction of the new Division Street bridge was completed. Supported by three large arches and over six hundred feet of concrete, the improved bridge served the city until its expansion in 1992 due to increasing traffic. The Aftermath: The people of Spokane gather along the river to view the broken beams and gas lines that contributed to the chaos of the Division Street bridge disaster. ~ Source: Image courtesy of Daniel Hagerman, Pixels. The Scene Explained: The Spokesman-Review was quick to spread the news of the catastrophe and those affected, noting the city's initial denial of responsibility. ~ Source: Image courtesy of the Spokesman-Review. Contributing Factors: Reporters hint at the bridge deficiencies, further examination of the bridge remains would support these claims. ~ Source: Image courtesy of the Spokesman-Review. Construction Progress: The task for reconstruction was given to the Washington Paving Company, with this wooden span serving temporarily before a concrete bridge was completed in 1917. ~ Source: Image courtesy of the University of Washington Digital Archives. Current Bridge: Including its expansion in 1992, the concrete Division Street bridge has effectively served the city of Spokane for over a century. ~ Source: Image courtesy of Antony-22, Wikimedia Commons. Steven Fry, “The Collapse of the Division Street Bridge,” Spokane Historical, accessed April 24, 2019, https://spokanehistorical.org/items/show/812. Arksey, Laura. 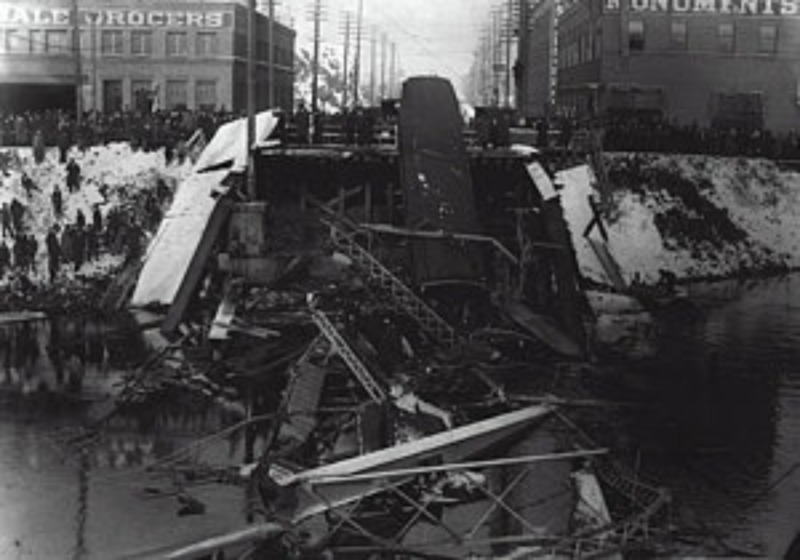 “Spokane’s Division Street Bridge Collapses on December 18, 1915.” History Link. The Free Encyclopedia of Washington State History. Posted on February 14, 2006. http://historylink.org/File/7642. Webster, John. 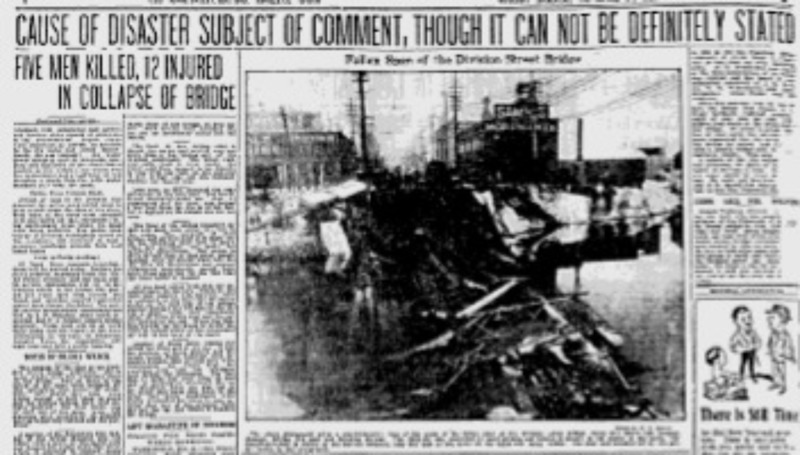 “Division Street Bridge Collapse in 1915 Killed Five, Injured Twelve.” The Spokesman-Review. 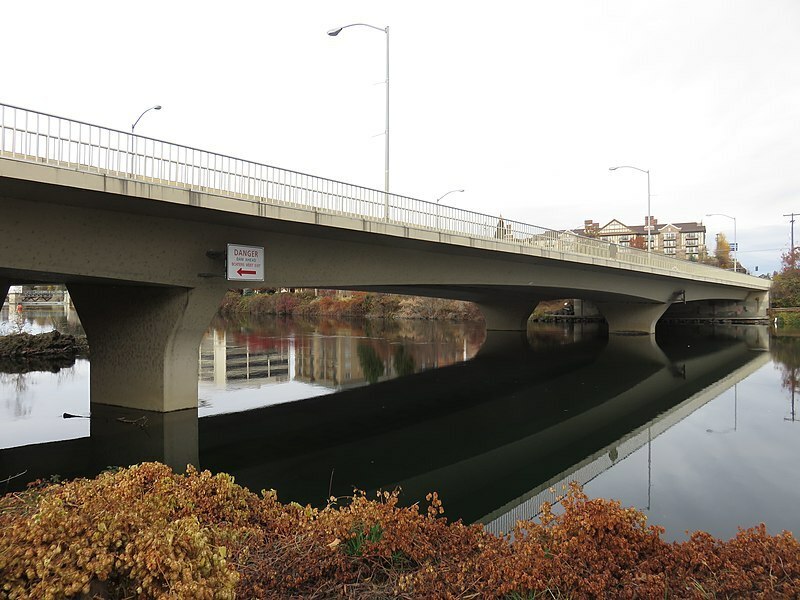 Published on September 4, 2016. http://www.spokesman.com/stories/2016/sep/04/Division_street_bridge_collapse_spokane/.